I just read an interesting paragraph from the home page of ReactOS. At present, ReactOS is listed as being in the alpha stage of development which means you should not download it tomorrow to use in your classroom computers. However, if the goals of this project can be pulled off, what will it mean to open source software in general and Linux in particular? Windows XP is the unquestioned “top dog” of operating systems. As of February 2009, ZDNet’s web site reports it as still running 71 percent of business PCs. If ReactOS can create a secure (read virus and malware free) Windows XP replacement, wouldn’t the majority jump to it before the likes of Linux? Of course Linux is real today and ReactOS may only be vaporware. Netbooks for Schools – The Microsoft View? The recent small format notebook computers have generally been called netbooks, though I understand it is actually like calling a tissue “Kleenex” or an electrostatic copy a “Xerox.” I don’t intend to step on anybody’s toes, but will go ahead with the term, anyway. One issue raised regularly in the various one-to-one student-computer scenarios is price. When I was talking about it years back, I envisioned that it wouldn’t be really feasible unless the units were priced under $250. Netbooks are just about there, and if the projection can be believed, the netbook-like OLPC-2 might someday be available for that price or less. Another issue is taking the main burden of cost away from the schools. Unless the netbook successfully replaces the present stack of textbooks (which it might), the netbook would be an extra cost in tough times for the finance of public education. The cost issue might be solved by letting student/parent be somewhat or wholly responsible for the tool through a multi-year lease or rental…read responsible for proper care. Parents could also opt to buy the unit themselves, reducing the school cost further. Durability is another issue. The unit should be ready for the use given it by a student. Enough said. Now, we come to the reason for this post. This blog is about open source software in schools. I just read in the online Wall Stree Journal that Windows 7 is going to be an option for the new netbooks we will see in the next year or so. BUT, the Microsoft proposal apparently is to limit the number of active programs to just three (3). For users of Roman numerals that is III. Given that the crippled netbook version would cost more than Linux, and Linux runs just fine on netbooks, I just don’t see the point. How about you? In case you read only this blog for your information on Linux, and didn’t already know, tomorrow is the release day for version 9.04 “Jaunty Jakalope”, a long term support update/security Linux (5 years for server, 3 years for desktop) Hardy Heron 8.04 was the most recent LTS and 10.04 will be the next. It is available with several desktop setups: Gnome, KDE, etc., and there is a special Netbook Remix for you lucky folks with a nice, shiny mini notebook onto which you want to put a full operating system. I just finished reading an article from the European Committee for Interoperable Systems (ECIS). Many thanks to Glyn Moody’s Open Blog for giving me the link to a document that details a history of Microsoft’s actions to compete with its rivals. I have been using computers since 1974, so I am no novice, nor am I unaware of the impact of Microsoft in the field. Nonetheless, I am still attempting to deal with my reactions to the concise set of examples of how Microsoft has traditionally competed with the likes of Netscape, Novell, IBM, Apple…and recently Linux. One man’s monopoly is another man’s bankruptcy, I guess. I am pulling for the success of FOSS in schools and out. Puzzles challenge students. My experience has been that the children enjoy the challenge and try their best. I encountered this puzzle in a book by Piers Anthony many years ago, and decided to try it with my classes of middle school students. Other grades might also be able to do the job, but it seemed a good challenge for grade 7. The idea is to make all the possible patterns that there are when using five squares and the following rules. All patterns must have five squares. All patterns must have squares that touch only at their sides with no diagonals (corners only) or gaps. There can be no duplicates. Mirrored or rotated figures are duplicates. You can challenge the kids using a simple sheet of graph paper, or you can get more information from my online guide which includes a printable PDF of the directions and enough layout grids to complete the job. I chose to NOT tell them how many shapes were possible. Judge that based on your students’ level. I sometimes used this as part of a lesson plan for substitutes to use if I was out of school. Naturally, it would be great if your students enjoyed the puzzle, and I would love to hear back from you about their experience. If you have suggestions for improving the guide, let me know that, too. GiftedMotion is a Java tool that takes a series of images (GIF, PNG, BMP, JPG) and combines them into an animation, like the ones commonly encountered on the Internet. GIF is usually pronounced with a soft G like “Jif.” GIF is one of the standard image types on the Internet and was designed for solid color images, not photographs. GIF format has been popular, in part, because it was possible to make simple, lean resource animations. GiftedMotion is NOT designed to make the individual graphics or provide intermediate images called “tweening”, so it isn’t a good tool for students to use interactively, developing animations in a classroom. However, it does a very good job of combining graphics you already have, and aids in the easy development of the transition timing from one still image to another as you make the animation. The interface is sparse, a few buttons on the bottom of the application window, and only one “File” menu for opening a set of images and saving the completed animations. You use the shift or ctrl key to select multiple images. The interface lets you rearrange the individual still images, and the buttons give you the options for transition timings, etc. GiftedMotion is useful on any computer where a current Java environment is installed, so it will run well on Linux, Macintosh and Windows. I’ve been out of town. Pennsylvania, Scranton area. 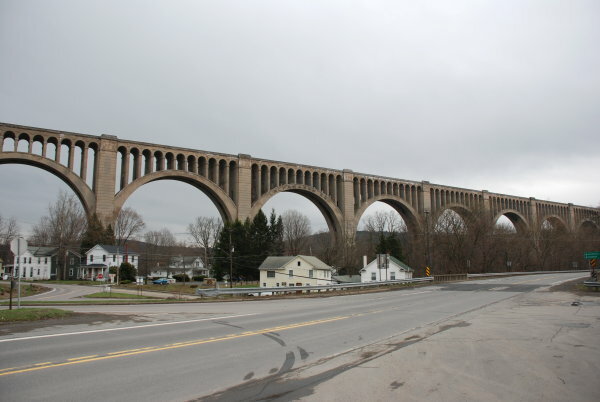 Got the chance to see the “Ninth Wonder of the World”, a viaduct train bridge over the Tunkhannock Creek in Nicholson, PA. I didn’t take my computer, and didn’t think about the blog or email. Freedom isn’t always about free software.